Have you ever had a glass of homemade passion fruit juice? If you haven’t, well it is truly a glass full of magic. 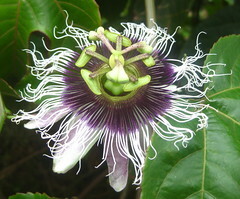 Passion fruit grows on a big vine. When it gets hot the vine grows extremely beautiful flowers. The flowers then turn into an oval shaped green fruit. As long as it stays warm the fruit will continue to turn a deep purple. When they fall off the vine they are ripe and ready to eat. If you’re not ready to process them right way, don’t worry because they will keep for quite awhile on the counter. Even if they’re shriveled up and not looking so good, they’re still fine to eat. After you’ve gathered up enough fruit, it’s time to make juice. When you add those three key ingredients you get delicious tasting passion fruit juice that is like no other. If you try this recipe you are bound to like it. Have you ever had passion fruit juice? Leave me a comment and let me know. Spring Planting: What’s Being Planted In Your Garden? If you haven’t started already, now is the perfect time to be preparing for your spring garden. In my opinion the best way to plant seeds is to start them indoors. A great way to do that is to use a Jiffy Greenhouse. You simply get the kit, water the Peat Pellets, plant the seeds, and watch them grow! Then, when spring arrives you’ll have a head start on your garden. If you don’t want to buy anything, there are many ways to make homemade pots for your seeds. Gardenbetty.com has some great articles showing how to create earth friendly, biodegradable seed pots from things you might otherwise throw away. Make sure to check out her articles on making newspaper pots and eggshell pots. I’ve tried them and they work great. My corn is loving their eggshell starters. Brazil’s deforestation has many negative effects such as how it significantly harms the land, air, and wildlife. In fact, between 1970 and now more than 230,000 square miles of the rainforests have been destroyed. As of 2008, only about 82.3% of the Brazilian rainforests remained uncut. Todd Bryan on How Do You Chop Your Firewood? Anna on How Do You Chop Your Firewood? Charlice @ chainsawstore.net on How Green Is Your Chainsaw? Howard Parker on How Do You Chop Your Firewood? Richard on How Green Is Your Chainsaw?